Secreted aspartic proteases (Saps) are considered as key virulence factors of Candida albicans. Hopefully our outlook will widen the knowledge of SAP7’s role in C. albicans pathogenesis. The goal of our study was to investigate SAP7 expression during C. albicans adhe­sion to intestinal human cells. Another objective was to study the role of SAP8-10 and transcriptional regulators: EFG1 and CPH1, using the mutants: Δsap, Δefg1, Δcph1 during growth on Caco-2 monolayer. SAP7 expression was analyzed using real time RT-PCR; relative quantification was normalized against ACT1 in cells after growth on Caco-2. Adherence assay of C. albicans to Caco-2 was performed in a 24-well-plate. The results proved that SAP7 can play a role during the initial adaptation of C. albicans to intestinal tract and decreases over time. Up-regulation of SAP7 occured in the absence of SAP8 and SAP10 (genetic alternations dependence). SAP7 can be regulated by the morphogensis’ regulators during C. albicans growth on epithelium. Adhesion of the mutants was indistinguishable from SC5314. The lack of neither SAP8-10 nor EFG1/CPH1 influences the adhesive behaviour of C. albicans. Deletion of SAP8-10 resulted in no filamentation defects. The results help better understand the role of SAP7 during adhesion and morphogenesis in C. albicans. The incidence and severity of candidiasis in immu­nocompromised or otherwise debilitated hosts, coupled with diagnostic difficulties and the high cost of treat­ment, have persuaded several investigators to focus on Candida albicans which is by far the most prevalent etiological agent of candidiasis. The most characteris­tic features of C. albicans are its extraordinary range of virulence factors, particularly adherence and spread on and/or through epithelial and endothelial tissues by inducing the filamentous growth and hyphal-associated aspartic proteases (Saps). Adherence to host tissues and morphological versatility are thought to be important in C. albicans virulence (Bertini et al., 2013; Braga-Silva and Santos, 2011; Naglik et al., 2011). C. albicans con­tains the hypha-associated genes: EFG1 and CPH1 that mediate adhesion of C. albicans to mucosal surfaces (Moazeni et al., 2012; Lo et al., 1997). Efg1 and Cph1 play a major role in promoting filamentous growth and regulate the expression of several genes with a crucial function in the invasion of host cells or in biofilm forma­tion (Moazeni et al., 2012; Staniszewska et al., 2013). As adhesion and morphogenesis are crucial for the latter, it is fundamental to study the role of EFG1 and CPH1 asso­ciated with morphogenesis and adhesion during C. albi­cans epithelial cells colonization. The secreted aspartic protease (Sap) family encompasses at least ten mem­bers (Saps1-10) containing a signal peptide, which are secreted, except for Sap9 and Sap10 that remain bound to the cell wall. Individual SAP genes are expressed at various stages of the infection process (Correia et al., 2010; Dalle et al., 2010; Jackson et al., 2007; Martin et al., 2011; Pietrella et al., 2013). Saps are characterized by a broad-spectrum proteolytic activity and virulence properties. Sap1-3 are active at acidic pH, whereas Sap4-6 are more active at neutral to slightly alkaline pH and are associated with hyphal growth (Aoki et al., 2011; Cadicamo et al., 2013; Naglik et al., 2011). Saps directly attack and degrade host proteins that are involvedin both innate as well as adaptive immunity (for exam­ple, complement, E‑cadherin, histatins, antibodies), and development of inflammations (Aoki et al., 2011; Cassone and Cauda, 2012; Mayer et al., 2013; Pietrella et al., 2013). Although the combined role of Sap1-6 in virulence has now come into question, and the Sap9 and Sap10 isoenzymes’ role in the cell surface integ­rity, cell separation, and adhesion, has been described (Albrecht et al., 2006; Schild et al., 2011), almost noth­ing is known of Sap7 and Sap8 competence (Taylor et al., 2005). Therefore, we presented our outlook in the hope that it will lead to widening knowledge of the role of SAP7-10 in C. albicans pathogenesis. The goal of the present study was to investigate theaspartic protease SAP7 gene expression during C. albi­cans adhesion to intestinal human cells. A further objective was to study the role of SAP8-10 and ofthe transcriptional regulators: EFG1 and CPH1, using the mutants: Δsap, Δefg1, Δcph1 during growth onthe Caco-2 monolayer. We tested the ability of the Δsap8-10 mutants to form hyphae and to adhere to intestinal cells comparing them with the mutants: Δcph1 and efg1 (attenuated in morphogenesis). Strains and Media. C. albicans strains used in the current study are listed in Table I (Lo et al., 1997; Fonzi and Irwin, 1993; Gillum et al., 1984; Liu et al., 1994;Puri et al., 2012; Schild et al., 2011; Staniszewska, 2009).C. albicans (strain no 82) was isolated from blood sam­ples from a patient treated for Ependymoma anaplas­ticum (Staniszewska, 2009; Staniszewska et al., 2014a; 2014b). The clinical isolate had been previously identi­fied according to colony colour on CHROMagar Can­dida medium and evaluated following API 20C AUX carbohydrate assimilation patterns (Staniszewska, 2009; Staniszewska et al., 2012; Staniszewska et al., 2014a;2014b). Additionally, the identification procedure was confirmed with genetic methods using rDNA sequenc­ing as previously described (Staniszewska, 2009; Staniszewska et al., 2012; Staniszewska et al., 2014b). All the strains used in the present study were stored on ceramic beads in Microbank tube (Prolab Diagnostics, Richmond Hill, ON, Canada) at –70°C. Prior to the respective examinations, routine culturing of strainsfor growth was conducted at 30°C for 18 h in YEPD (Ness et al., 2010). Cultivation and Infection of Caco-2 Cell Line (ATCC HTB27, LGC, Poland). Following the sup­plier’s guidelines, monolayers of the colon adenocar­cinoma derived cell line were cultured in the Eagle’s Minimum Essential Medium (EMEM) containing 10% (v/v) FCS, 1mM pyruvic acid, without antibiotics or antifungal agents and maintained in a humidified incubator at 37°C in 5% (v/v) CO2. For the experiment 1.2 × 105 of Caco-2 cells (/ml EMEM) were seeded into 24-well-plates (Corning, USA) and cultured up to 18 h. Next, after 18 h post seeding the Caco-2 monolayers were inoculated with 105 log phase yeast cells (/ml EMEM) of C. albicans wild type and mutants. After 18 h of incubation the Caco-2 was lysed by adding sterile water resulting in recovery of C. albicans cells. ΔΔCT = ΔCT – ΔCT parental strain = 2–ΔΔCT. Assay of adherence to human line Caco-2 epithe­lial cells. Adherence of C. albicans to the Caco-2 cell line (ATCC HTB-37TM) was performed as described previously Hashash et al. (2011). Briefly, the Caco-2 cell line was cultivated in the EMEM containing 10% (v/v) FCS at 37°C at 5% (v/v) CO2. After trypsinisa­tion, with the use of 0.25% trypsin (Biomed-Lublin, Lublin, Poland) 1.2 × 105 Caco-2 cells (/ml EMEM) were incubated for at least 16 h on a 24-well-plate (Costar, Corning, NY, USA) to generate a confluent layer. Subse­quently, the blastoconidia were grown overnight in the YEPD medium at 30°C. Then, 104 blastoconidial cells(/ml saline) were added to each well of the epithelial cells to be afterwards incubated for 90 min (adhesion phase). Next, the non-adherent cells were removed by standard rinsing, and the wells were overlaid with Sabouraud dextrose agar and allowed to solidify. After 18 h growth at 37°C, the number of adherent cells was determined by colony counting and compared with the controls on the Sabouraud dextrose agar plates. Adher­ence was expressed as a percentage of the total number of cells added (control cells). Microscopy. The morphological transition from yeast-to-hyphal cells was performed by using LEXT 3D Measuring LASER Microscope OLS4000 (Olympus, USA) and Scanning Electron Tabletop Microscope TM 100 (Hitachi, Japan). Briefly, Caco-2 cells grown on 12 mm glass coverslips were inoculated for 21 days post seeding with 104 log phase yeast cells (/ml saline) of strains tested. After 90-min incubation at 37°C,the cells were washed three times with PBS to remove non-adherent yeast and then fixed in 2% glutaralde­hyde for 10 min. Statistical analysis. Each experiment was per­formed in triplicate on three separate occasions. The percentage of cell adhesion and the SAP7 expression were formulated as a mean ± standard deviation. Sta­tistical differences were evaluated through compari­son with the Wilcoxon test, P values ≤ 0.05 were con­sidered significant. Based on recently published data (Naglik et al., 2008; Staniszewska et al., 2014a), the lat­ter method was used to calculate statistical differences between relative gene expression and cell adhesion. The SAP7 gene expression during adhesion to the Caco-2 Monolayer. The level of SAP7 transcript nor­malized to the transcription of ACT1 is presented in Table II. The expression of the SAP7 gene in the cells of the parental strain CAF2-1 and Δsap8 decreased 1.7- and 1.3-fold respectively after 18-h growth on Caco-2. Conversely, in the cells of Δsap8, SAP7 mRNA increased 3.6- and 4.8-fold after 3-h and 18-h growth on the intestinal cells respectively compared to the parental strain CAF2-1. Moreover, the expression of SAP7 decreased 2.3- and 1.1-fold in the cells of Δsap9, and Δsap9-10 respectively after 18-h growth on Caco-2. On the other hand, the SAP7 mRNA slightly increased 1.1-fold in the null Δsap10 mutant. In the cells of the parental strain CAI4, SAP7 decreased 2.5-fold after 18-h growth on Caco-2. After 3-h growth on Caco-2, SAP7 was up-regulated in Δsap9, Δsap10, and Δsap9-10 (1.3-, 1.5- and 1.3-fold as compared respectively to the parental strain CAI4). After 18-h growth, SAP7 was up-regulated in Δsap9, Δsap10, and Δsap9-10 (1.4-, 3.9-, and 3.1-fold as compared respectively to the parental strain CAI4). We showed that after 18-h growth, Δcph1 cells showed SAP7 decreased 2.3-fold, while Δefg1 dis­played a slight up-regulation of this gene (1.2-fold). The expression of SAP7 on the line Caco-2 at 3 h post-inoculation was higher than in 18-h grown cells. The obtained results proved that SAP7 can play a role dur­ing the initial adaptation of C. albicans to the intestinal tract and that it decreases over time. Determination of C. albicans adhesion to Caco-2 monolayer. To study whether the genetic alternations found in SAP and EFG1 and CPH1 genes could have an impact on in vitro virulence, we investigated the adherence of the C. albicans null mutants in a model of epithelial cells, and compared them with that of the wild type strains: SC5314 and no 82 as well as the res­cued strains. As depicted in Table III, the adherence ability varied within each species with the values from 0.533 ± 0.321 to 11.3 ± 10.324 for the wild type strains: SC5314 and no 82, and from 0.68 ± 0.593 to 11.8 ± 7.532 for the mutants. A significant trend toward an affected adhesion of morphogenesis mutants was noted by com­parison with the wild type isolate no 82 (P ≤ 0.05). Our results demonstrated that lack of Cph1 protein influence significant reduction in their adhesive ability (P ≤ 0.05) compared to the wild type strain no 82. With Δcph1 adhesion was significantly lower (16.6-fold) than with Δefg1 (2.1-fold) compared to the wild type strain no 82. In opposition, the SC5314 and Δcph1 strains showed almost similar adhesion, whereas Δefg1 revealed 9.85-fold increase in adhesive mode compared to the paren­tal strain (SC5314). In this particular case of Δcph1, reintroduction of the one copy of CPH1 restored adhe­sion. Thus the presence or absence of CPH1 affected the adhesiveness behaviour of C. albicans cells. The adhesion properties depended on the morpho­genesis mutants (compared to the wild type strain 82) while for the mutants Δsap9 and Δsap10 almost the same level of adhesion was observed (P ≥ 0.05). Moreo­ver, the mutant Δsap8 adhered less efficiently to epithe­lial cells (6.2-fold reduction) compared to strain no 82. In the case of the Δsap8 mutant, adhesion of the lat­ter strain was reduced to statistically significant levels (P ≤ 0.05). Moreover, when strain SC5314 was analyzed, there were no detectable differences in its percentage of adhesion in comparison to the mutants (P ≥ 0.05, Table III). In this regard, all the tested C. albicans strains were able to adhere to the epithelial cell line to a dif­ferent degree. C. albicans morphology on the intestinal Caco-2 monolayer. Electron microscope studies revealed a, clearly reduced capacity of hyphal growth of the mutant Δefg1 in comparison with the wild type strain SC5314 on enterocyte monolayer (Fig. 1). As shown microscope micrographs, following an 90-min attach­ment phase of yeast cells, we observed that all fun­gal strains had switched to hyphal growth form. TheΔefg1 mutant latter strain showed morphologies tended to be slightly distorted compared to those of the wild type strain. Microscopically, no differences in the Δsap8-10 mutants’ morphogenesis potential dur­ing adhesion to Caco-2 monolayer were observed after 90 min, indicating epithelial adherence and possibly cell proliferation. As far it is known (Cadicamo et al., 2013; Correiaet al., 2010; Dalle et al., 2010; Jackson et al., 2007;Martin et al., 2011; Naglik et al., 2003; 2008; Taylor et al., 2005), the increased expression of specific Saps at various stages of the infection plays a special role in tissue invasion. As the role of SAP7 in C. albicans viru­lence had remained unknown, we showed in our study, that the level of the SAP7 expression correlates with the importance of this gene for the early stage of the Caco-2 intestinal tissues invasion. It is worth noting, that dif­ferences in the SAP7 expression between C. albicans cells colonizing Caco-2 depend on genetic alternations. These results showed clearly that the up-regulation of SAP7 occurs in the absence of SAP8 and SAP10. The compensation for the absence of Sap10 activity by Sap7 demonstrated their similar function. As showed Bocheńska et al. (2013) these two Saps out of 10 isoen­zymes are unable to release bactericidal peptides from human Hb. As Sap10 participated in the processing of cell wall proteins (Schild et al., 2011), the function of Sap7 was speculated and needed experimental verifica­tion. Our results perfectly agree with the previous study concerning Sap7 activity at neutral pH. We demon­strated (Staniszewska et al., 2014a) that SAP7 may help the fungus to cause systemic infections. We also showed that morphogenesis factors can be regulators of SAP7 at early stage of epithelial infection. As desribed Pierce and Kumamoto (2012), Efg1 is a transcritional regula­tor of a large number of genes and many differences in the gene expression are suspected to occur in response to changes in the EFG1 expression. Moreover, accord­ing to the latter authors, in the human gastrointesti­nal (GI) tract, wild type cells and cells with low Efg1 activity are expected to express factors that allow them to interact with host epithelial cells. We proposed that the SAP7 activity provides a mechanism which allows the colonizing of human cells. As showed Nobile et al. (2012) C. albicans is one of the very few fungal species that can efficiently form biofilms in healthy mamma­lian cells. Following Nobile et al. (2012), we suggested that SAP7 is involved in the biofilm network in C. albi­cans as a ‘young’ gene engaged in an early organisation of biofilm (adhesion to the intestinal monolayer). On the other hand, C. albicans hydrolytic enzymes might be regulated differently during various experiments and what is more, these genes’ expression is strain-specific. Lermann and Morschhäuser (2008) showed that Saps are not required for the invasion of reconsti­tuted human epithelia (RHE) by C. albicans. Therefore, environmental conditions have an important impact on the SAP expression pattern in C. albicans. Moreover, the proteinase encoded by the SAP7 gene, if translated, may be associated with C. albicans early infection and is quite different from laboratory culture conditions (Cadicamo et al., 2013; Taylor et al., 2005). C. albicans possesses a remarkable capacity to adhere to tissues (Dalle et al., 2010; Yan et al., 2013). Moreo­ver, adhesion is influenced by enhanced expression and production of Saps (Albrecht et al., 2006; Braga-Silva and Santos, 2011; Dalle et al., 2010; Martin et al., 2011; Seabra et al., 2013). In our in vitro model of epithelial infection, Δsap8-10 and morphogenesis mutants dis­played adherence to Caco-2 monolayer, where hyphae germinated. We characterized the morphology of the two morphogenesis mutants and four Δsap compared to the wild type by CLSM, using the Caco-2 cell line. The strains proliferated, underwent morphogenesis and caused epithelial cells lysis. Although deletion of CPH1 reduces hyphal growth on solid medium (Tsai et al., 2013), we showed that it still forms hyphae during adhesion to a polarized monolayer of Caco-2 epithe­lial cells (Fig. 1). In stark contrast, Δefg1 was slightly attenuated in developing filaments (Fig. 1). While, the extent of adhesion was strain-depended, a general trend was observed among all the strains tested, confirming a slightly reduced adhesion ability of the morphogen­esis mutants, with Δsap9 and Δsap10 strongly adhering to the epithelial cells, followed by the wild type strain no 82 (Table III). Although, Cph1 appears to contrib­ute to adhesion (Δcph1 was reduced in this capacity, Table III), other factors, particularly agglutinin-like sequence (ALS) are the major contributor to epithelial cells adhesion (Tsai et al., 2013). As discussed Brand (2012), deletion of one member of SAPs effected on the compensation of genes encoding surface proteins that are involved in adhesion i.e., ALS3, HWP1. In our study, deletion of SAP9 resulted in only slightly altered adhesion to Caco-2 compared to the wild type strains (Table III). To be more precise, Δsap9 was more effective in adhesion than its parental strain SC5314. Strikingly, our data showed that adhesion activity of Δsap10 was reduced in higher level compared to SC5314. We also found that strains were not adhe­sion activity correlated, pointing to a strain-depend­ent phenomenon rather than a significant association between Saps and adhesion. It was demonstrated that the ability of the mutants: Δsap, Δefg1, and Δcph1 to adhere to epithelial cells is not altered significantly compared with the wild types. Thus we suggested that a lack of morphogenesis factors as well as Δsap8-10 can­not be important for adhesion to the intestinal layer. Furthermore, deletion of the SAP8-10 genes resulted in no filamentation defects; however these have not been reported to date. Overall, this analysis indicates that unlike SC5314, the significant differences in adhesion of Δsap, Δefg1 and Δcph1 during the growth on Caco-2 relative to the clinical strain no 82 are not meaningful for this process if the strains genetic backgrounds are In vitro SAP7 expression in Candida albicans too different. On the other hand, as reviewed by Naglik et al. (2011), Sap9 and Sap10 may indirectly contribute to adhesion by targeting covalently linked fungal cell wall proteins such as Cht2, Ywp1, Als2, Rhd3, Rbt5, Ecm33 and Pga4 and glucan cross-linking protein Pir1. Furthermore, the findings of Schild et al. (2011) on the in vivo expression profile of Saps1-6 supports a role of Sap1-3 in the adherence process to epithelial cells and Sap4 to Sap6 in assisting C. albicans cells to evade phagocytosis (Bertini et al., 2013; Braga-Silva andSantos, 2011; Han et al., 2011; Naglik et al., 2011). To our knowledge, ours is the first study of the role of SAP7 in the early stage of the colo­rectal carcinoma Caco-2 invasion In order to benefit from these results in therapy (development of proper anti-fungal compounds or potentially effective com­bination vaccines including Sap7) additional in vivo experiments should be conducted. The work was supported by the grant No DEC-2011/03/D/NZ7/06198 from National Science Center, Kraków, Poland. The authors would like to thank sincerely Prof. B. Hube for the strains CAF2-1, CAI4, Δsap9, Δsap10, Δsap9-10, Δsap8. We are extremely grateful to Professor Hsiu-Jung Lo from the National Health Research Institute in Zhunan (Taiwan) for providing us with the following strains: Can16, YLO323, HLC52, HLC74 and HLC84. We are very grateful to the Laboratory of Miniaturized Chemical System (Warsaw University of Technology) for access to confocal and electron microscopes. Albrecht A., A. Felk, I. Pichova, J.R. Naglik, M. Schaller,P. de Groot, D. MacCallum, F.C. Odds, W. Schafer, F. Klis and others. 2006. Glycosylphosphatidylinositol-anchored proteases of Candida albicans target proteins necessary for both cellular pro­cesses and host-pathogen interactions. J. Biol. Chem. 281: 688–694. Amberg D., D. Burke and J. Strathern. 2005. Yeast RNA isolations, Techniques and Protocols #6, pp. 127–131. In: Amberg D., D. Burke and J. Strathern (eds). Methods in Yeast Genetics. Cold Spring Har­bor Laboratory Press, Cold Spring Harbor. Aoki W., N. Kitahara, N. Miura, H. Morisaka, Y. Yamamoto,K. Kuroda and M. Ueda. 2011. Comprehensive characterization of secreted aspartic proteases encoded by a virulence gene family in Candida albicans. J. Biochem. 150: 431–438. Bertini A., F. De Bernardis, L.A. Hensgens, S. Sandini, S. Senesiand A. Tavanti. 2013. Comparison of Candida parapsilosis, Can­dida orthopsilosis, and Candida metapsilosis adhesive properties and pathogenicity. Int. J. Med. Microbiol. 303: 98–103. Bocheńska O., M. Rapala-Kozik, N. Wolak, G. Bras, A. Kozik, A. Dubin, W. Aoki, M. Ueda and P. Mak. 2013. Secreted aspartic peptidases of Candida albicans liberate bactericidal hemocidins from human hemoglobin. Peptides 48: 49–58. Braga-Silva L.A. and A.L. Santos. 2011. Aspartic protease inhibitors as potential anti-Candida albicans drugs: impacts on fungal biology, virulence and pathogenesis. Curr. Med. Chem. 18: 2401–2419. Brand A. 2012. Hyphal Growth in Human Fungal Pathogens and Its Role in Virulence. Int. J. Microbiol. 2012:517529. Cadicamo C.D., J. Mortier, G. Wolber, M. Hell, I.E. Heinrich,D. Michel, L. Semlin, U. Berger, H.C. Korting, H.D. Holtje and others. 2013. Design, synthesis, inhibition studies, and molecu­lar modeling of pepstatin analogues addressing different secreted aspartic proteinases of Candida albicans. Biochem. Pharmacol. 85: 881–887. Cassone A. and R. Cauda. 2012. Candida and candidiasis in HIV-infected patients: where commensalism, opportunistic behavior and frank pathogenicity lose their borders. Aids 26: 1457–1472. Correia A., U. Lermann, L. Teixeira, F. Cerca, S. Botelho, R.M.da Costa, P. Sampaio, F. Gartner, J. Morschhauser, M. Vilanova and others. 2010. Limited role of secreted aspartyl proteinases Sap1 to Sap6 in Candida albicans virulence and host immune response in murine hematogenously disseminated candidiasis. Infect. Immun. 78: 4839–4849. Dalle F., B. Wachtler, C. L’Ollivier, G. Holland, N. Bannert,D. Wilson, C. Labruere, A. Bonnin and B. Hube. 2010. Cellular interactions of Candida albicans with human oral epithelial cells and enterocytes. Cell Microbiol. 12: 248–271. Fonzi W.A. and M.Y. Irwin. 1993. Isogenic strain construction and gene mapping in Candida albicans. Genetics 134: 717–728. Gillum A.M., E.Y. Tsay and D.R. Kirsch. 1984. Isolation of the Candida albicans gene for orotidine-5’-phosphate decarboxylase by complementation of S. cerevisiae ura3 and E. coli pyrF mutations. Mol. Gen. Genet. 198: 179–182. Han T.L., R.D. Cannon and S.G. Villas-Boas. 2011. The metabolic basis of Candida albicans morphogenesis and quorum sensing.Fungal Genet. Biol. 48: 747–763. Hashash R., S. Younes, W. Bahnan, J. El Koussa, K. Maalouf,H.I. Dimassi and R.A. Khalaf. 2011. Characterisation of Pga1,a putative Candida albicans cell wall protein necessary for proper adhesion and biofilm formation. Mycoses 54: 491–500. Jackson B.E., K.R. Wilhelmus and B. Hube. 2007. The role of secreted aspartyl proteinases in Candida albicans keratitis. Invest. Ophthalmol. Vis. Sci. 48: 3559–3565. Lermann U. and J. Morschhäuser. 2008. Secreted aspartic proteases are not required for invasion of reconstituted human epithelia by Candida albicans. Microbiology 154: 3281–3295. Liu H., J. Köhler and G.R. Fink. 1994. Suppression of hyphalformation in Candida albicans by mutation of a STE12 homolog. Science 266: 1723–1726. Livak K.J. and T.D. Schmittgen. 2001. Analysis of relative gene expression data using real time quantitative PCR and the 2(-Delta Delta C(T)) Method. Methods 25: 402–408. Lo H.J., J.R. Kohler, B. DiDomenico, D. Loebenberg, A. Cacciapuoti and G.R. Fink. 1997. Non filamentous C. albicans mutants are avirulent. Cell 90: 939–949. Martin R., B. Wachtler, M. Schaller, D. Wilson and B. Hube. 2011. Host-pathogen interactions and virulence-associated genes during Candida albicans oral infections. Int. J. Med. Microbiol. 301: 417–422. Mayer F.L., D. Wilson and B. Hube. 2013. Candida albicans patho­genicity mechanisms. Virulence 4: 119–128. Moazeni M., M.R. Khoramizadeh, P. Kordbacheh, Z. Sepehri­zadeh, H. Zeraati, F. Noorbakhsh, L. Teimoori-Toolabi andS. Rezaie. 2012. RNA-mediated gene silencing in Candida albicans: inhibition of hyphae formation by use of RNAi technology. Myco­pathologia 174: 177–185. Naglik J.R., S.J. Challacombe and B. Hube. 2003. Candida albicans secreted aspartyl proteinases in virulence and pathogenesis. Micro­biol. Mol. Biol. Rev. 67: 400–428. Naglik J.R., D. Moyes, J. Makwana, P. Kanzaria, E. Tsichlaki,G. Weindl, A.R. Tappuni, C.A. Rodgers, A.J. Woodman, S.J. Chal­lacombe and others. 2008. Quantitative expression of the Candida albicans secreted aspartyl proteinase gene family in human oral and vaginal candidiasis. Microbiology 154: 3266–3280. Naglik J.R., D.L. Moyes, B. Wachtler and B. Hube. 2011. Candida albicans interactions with epithelial cells and mucosal immunity. Microbes Infect. 13: 963–976. Ness F., V. Prouzet-Mauleon, A. Vieillemard, F. Lefebvre, T. Noel, M. Crouzet, F. Doignon and D. Thoraval. 2010. The Candida albi­cans Rgd1 is a RhoGAP protein involved in the control of filamen­tous growth. Fungal Genet. Biol. 47: 1001–1011. Nobile C.J., E.P. Fox, J.E. Nett, T.R. Sorrells, Q.M. Mitrovich, A.D. Hernday, B.B. Tuch, D.R. Andes and A.D. Johnson. 2012.A recently evolved transcriptional network controls biofilm develop­ment in Candida albicans. Cell 148: 126–138. Pierce J.V. and C.A. Kumamoto. 2012. Variation in Candida albi­cans EFG1 expression enables host-dependent changes in colonizing fungal populations. mBio 3: e00117-00112. Pietrella D., N. Pandey, E. Gabrielli, E. Pericolini, S. Perito,L. Kasper, F. Bistoni, A. Cassone, B. Hube and A. Vecchiarelli. 2013. Secreted aspartic proteases of Candida albicans activate the NLRP3 inflammasome. Eur. J. Immunol. 43: 679–692. Puri S., R. Kumar, S. Chadha, S. Tati, H. Conti, B. Hube, P. Cullenand M. Edgerton. 2012. Secreted Aspartic Protease Cleavage of Candida albicans Msb2 Activates Cek1 MAPK Signaling Affecting Biofilm Formation and Oropharyngeal Candidiasis. PLoS ONE 7: e46020. Schild L., A. Heyken, P.W. de Groot, E. Hiller, M. Mock, C. de Koster, U. Horn, S. Rupp and B. Hube. 2011. Proteolytic cleavage of covalently linked cell wall proteins by Candida albicans Sap9 and Sap10. Eukaryot. Cell 10: 98–109. Seabra C.L., C.M. Botelho, M. Henriques and R. Oliveira. 2013. Differential adherence and expression of virulence traits by Candida albicans and Candida parapsilosis in mono- and dual-species cul­tures in arti icial saliva. Mycopathologia 176: 33–40. Staniszewska M. 2009. Ph.D. Thesis, Search for Candida albicans virulence factors. Independent Laboratory of Streptomyces and Fungi Imperfecti. National Institute of Public Health-National Institute of Hygiene. Warsaw. Poland. Staniszewska M., M. Bondaryk, K. Siennicka and W. Kurzatkowski. 2012. 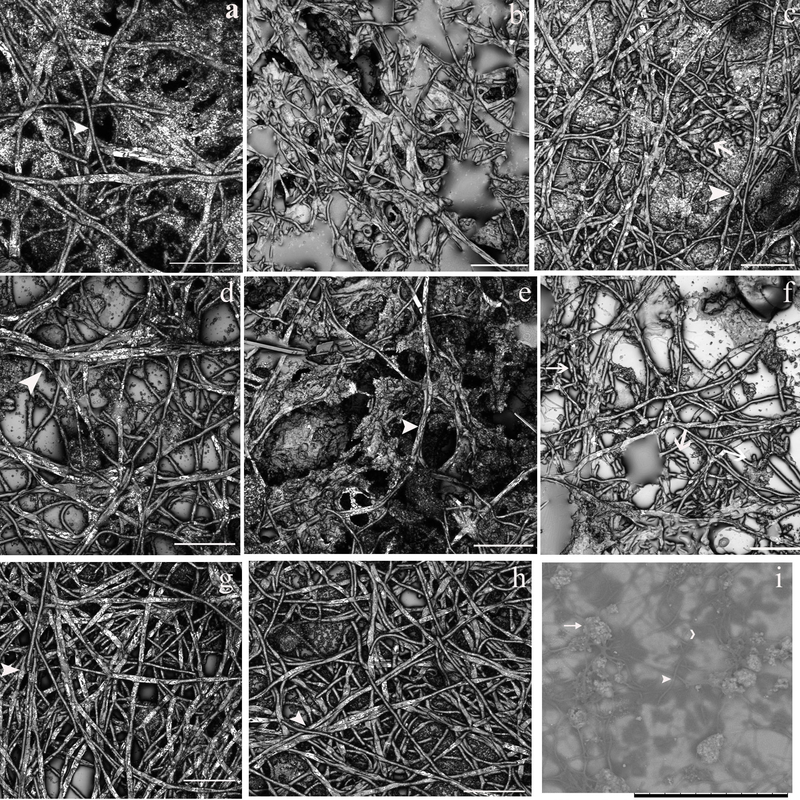 Ultrastructure of Candida albicans Pleomorphic Forms: Phase-Contrast Microscopy, Scanning and Transmission Electron Microscopy. Pol. J. Microbiol. 61: 129–135. Staniszewska M., M. Bondaryk, E. Swoboda-Kopeć, K. Siennicka, G. Sygitowicz and W. Kurzątkowski. 2013. Candida albicans mor­phologies revealed by scanning electron microscopy analysis. Braz. J. Microbiol. 44: 813–821. Staniszewska M., M. Bondaryk, T. Malewski and W. Kurzatkowski.2014. Quantitative expression of Candida albicans aspartyl protein­ase genes SAP7, SAP8, SAP9, SAP10 in Human Serum in vitro. Pol. J. Microbiol. 63: 15–20. Staniszewska M., Bondaryk M., Malewski T. and Schaller M. 2014. The expression of the Candida albicans gene SAP4 during hyphal formation in human serum and in adhesion to monolayer cell culture of colorectal carcinoma Caco-2 (ATCC). Centr. Eur.J. Biol. 9: 796–810. Taylor B.N., P. Staib, A. Binder, A. Biesemeier, M. Sehnal,M. Rollinghoff, J. Morschhauser and K. Schroppel. 2005. Profile of Candida albicans-secreted aspartic proteinase elicited during vaginal infection. Infect. Immun. 73: 1828–1835. Tsai P.W., Y.T. Chen, P.C. Hsu and C.Y. Lan. 2013. Study of Can­dida albicans and its interactions with the host: A mini review. Bio­Medicine 3: 51–64. Yan L., C. Yang and J. Tang. 2013. Disruption of the intestinal mucosal barrier in Candida albicans infections. Microbiol. Res. 168: 389–395.